Minutes from the Walt Disney World Resort®, Univeral Orlando, Sea World, world-class shopping and extensive dining opportunities, The Villas at Seven Dwarfs Lane is in the perfect location for your Central Florida Vacation. From Orlando take I-4 West to Exit 68, SR 535 South. Go left onto route 192 East (Irlo Bronson Memorial Highway) to Seven Dwarfs Lane (between markers 12 and 13). From Orlando International Airport take the Airport Exit South to the Central Florida Greenway (SR 417 South). Take International Drive West, Exit 6, toward 535 South. Go left onto Route 192 (Irlo Bronson Memorial Highway) to Seven Dwarfs Lane (between markers 12 and 13). 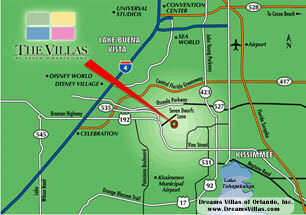 Directions to individual villas will be provided upon booking with confirmation. Within walking distance to a Sam's Discount Club, Super Target, Publix Supermarket, restaurants and several fast food establishments. Walking distance to a Lynx Bus stop. Directions to all major attractions, shopping and dining locations will be provided in a 'Welcome Packet' in the villa upon check-in.